Looking to sell your property, let us help! MAIN DESCRIPTION Fresh to the market is this bright, three bedroomed, semi detached house in Balby. With modern decor, modern breakfast kitchen, great wood-effect laminate flooring and a super bathroom, this great family home is ideal for first time buyers and investors alike. Within walking distance of the local primary school, shops and medical centre, it’s also within easy reach of Doncaster, the A1(M) and the wider motorway network. ENTRANCE HALL Through the uPVC half glazed front door is beautifully finished hallway with hard-wearing slate floor, plenty of room for coats and shoes, and a lovely feature wooden stair case. There’s some great brick-effect wallpaper which gives the space bags of character, and archways through to the kitchen/diner and front reception room. 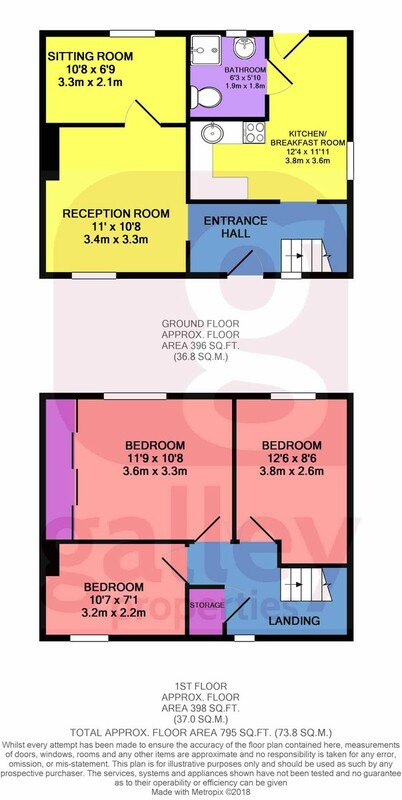 RECEPTION 1 11′ 1" x 10′ 9" (3.4m x 3.3m) Decorated in cheerful modern colours, the front room currently serves as a living room, but the beauty of this house is the flexibility of the space within. There’s a central ceiling light, radiator under the front facing recently fitted UPVc window, tv point and power sockets. Wood laminate flooring runs through out the ground floor and nicely compliments the feature wooden doors and skirting boards. RECEPTION ROOM 2 10′ 9" x 6′ 10" (3.3m x 2.1m) Overlooking the rear garden, this brightly decorated space currently serves as an office and spare bedroom. With a radiator under the UPVc window, central ceiling light, tv point and power sockets, it’s very adaptable and would make an excellent dining room, play room or snug. KITCHEN/BREAKFAST ROOM 9′ 2" x 6′ 10" (2.8m x 2.1m) Cleverly designed, this great use of space incorporates a nicely laid out kitchen area, complete with a range of wall and base wooden fronted cupboards, space for an under counter fridge and a neat circular sink with stainless steel mixer tap. Modern white tiled splash backs, contemporary extractor hood and contrasting floor tiles to compliment the worktops. On the opposite wall is the radiator, and room for a table and chairs, fridge freezer and plumbing for a dishwasher or washing machine. Several spotlights provide excellent illumination. Door to shower room, side facing UPVc window and part glazed UPVc door leads to the rear garden. Recently fitted combi boiler with extended warranty. SHOWER ROOM 6′ 2" x 6′ 2" (1.9m x 1.9m) Beautifully finished, this modern and streamlined shower room features a contemporary design white low-level WC, washbasin and shower cubicle. Fully tiled floor to ceiling in lovely marble effect ceramic tiles, this really is a calming space to relax. Rear facing UPVc window. LANDING With stunning made to measure wooden stairs leading from the hallway and matching wooden ballustrades along the landing, this really is a stylish space with the wow factor. With feature doors off to the three bedrooms, there is also a very useful built-in cupboard on the landing, which add lots of valuable extra storage! BEDROOM 1 11′ 9" x 10′ 9" (3.6m x 3.3m) The master bedroom benefits from generous, built-in wardrobes along an entire wall, with sleek wooden sliding doors, maximises the storage space available. It’s decorated in calm, neutral colours with a fabulous feature wall and has lovely olive wood effect laminate flooring. It has a radiator under the wide window, power points and central ceiling light. BEDROOM 2 12′ 5" x 8′ 6" (3.8m x 2.6m) This is a fabulous room, decorated in bright and cheerful colours and currently in use as a craft room. It’s got bags of natural light from the rear facing UPVc window and lovely wood effect laminate flooring. There’s plenty of space for a double bed and bedroom furniture as well. Complete with a radiator, power sockets and central ceiling light. BEDROOM 3 10′ 5" x 7′ 2" (3.2m x 2.2m) With wood-effect laminate flooring and cream walls, the third bedroom is a clean slate and would make the perfect home office or nursery. There’s a radiator, power sockets and central ceiling light, and the UPVc window looks out over the front garden. EXTERIOR SPACE FRONT GARDEN Laid mainly to lawn and surrounded by trimmed box hedges, the front garden is accessed through a pretty wrought iron gate. Featuring a shared drive leads to a parking space in the rear garden, there’s also a concrete path up to the front door and plenty of room for the wheelie bins. BACK GARDEN The rear yard is fully enclosed with wooden fence panels and so ideal for those with small children and pets. It’s mostly laid to lawn, with a couple of small paved areas which are perfect for a table and chairs. Stepping stone paths across the lawn lead to the washing line and a generously sized garden shed. There’s also an outside tap, some mature planting in the garden beds which lie along the fence line and access to the front through a side gate. DISCLAIMER Whilst we take great care to provide accurate and reliable information, these particulars are intended as a general guide. All measurements are subject to a margin of error. Galley Properties have not tested any of the services, systems or appliances and therefore cannot verify that they are in working order or fit for purpose, (including heating systems). All photographs and floor plans are for guidance purposes only, please note some photographs may have been taken using a wide angle lens. Fixtures and fittings are only included subject to arrangement. Reference made regarding the tenure, (and where applicable lease term) is based on information supplied to Galley Properties and it is strongly recommended that potential buyers seek verification on tenure and lease term as well as all other matters through their own solicitor. Fill out the form below and we'll get back in touch with you to arrange a viewing.